Opening the night the 1st bout prospect Elliot Brown (2-4 2KOs) defeated Dylan Bamber Cox (0-1) in the Super Lightweights division. This was scheduled for a four rounder but only went 37 seconds into the first round ended by TKO. Brown wasted no time coming in strong and laying hands on cox giving Brown the win. Dylan Cox seemed to be no match for Elliots speed and power landing hard and big. 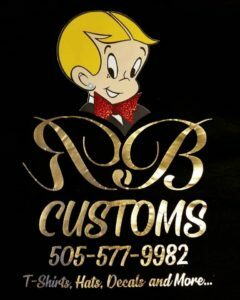 The second bout Andres Cortez now (9-0, 5KOs) improved his record against Omar Castillo (5-1, 2KOs) in the Super Featherweight Division schedule for 6 rounds. Cortes established his jab early on and working it well, mixing things from top to bottom. 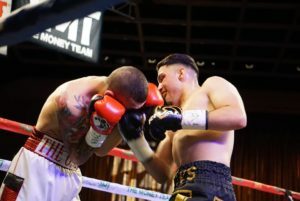 The second round didn’t have much change in direction as Cortes applied the pressure keeping Castillo on the ropes landing solid combos and taking the round. With 1 min 16 seconds in the third round the fight was called to a halt by TKO! 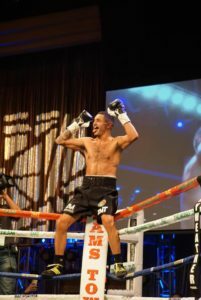 Lightweight unbeaten and rising Rolando Romero now (6-0, 5KOs) defeated Dieumerci Nzau (11-6, 8KOs) within 1 minute and 17 seconds in the 1st round what was set for 6 keep the fans on their feet. Romero found strength right away landing heavy up top and hurting Nzau early on. Roladno giving combinations high and low using his power being consistently landed a stunning head shot that knocked Nzau down. 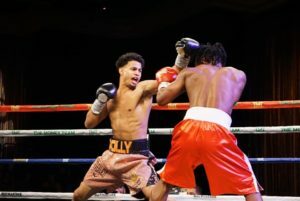 Angelo ¨El Chinito” Leo unbeaten prospect (14-0, 8KOs) Vs. Glenn Porras (31-8, 19KOs) in the Super Bantamweight division was the fourth bout of the night. Angelo using combinations with fast hands while changing angles gave Porras no chance to survive. 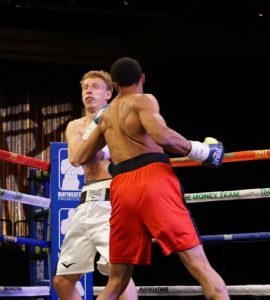 Leo landing his signature punch,a left hook to the body putting the Filipino Veteran down to the canvas in 1 minute and 37 seconds offirst round earning ¨El Chinito¨ the KO victory. After the fight, Angelo stated ¨I felt I had a great performance, we been practicing that shot. I was looking forward to getting the KO, but was prepared to go the distance. The only challenge I faced was that it was my first Southpaw opponent.¨ Proving himself once again Angelo Leo continues to climb in the ranks, keep and eye on this rising star. 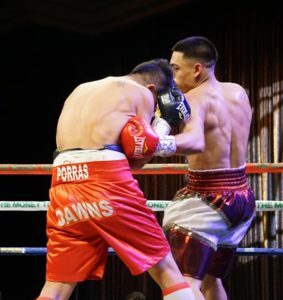 The main event was in the Super Lightweight division as Juan Heraldez now (15-0, 9KOs)defeated Maynard Allison (11-4, 8KOs) with a 3rd round TKO. The first round didn’t have much action, it was a feeling out process. Clearly being a even round for both. The 2nd round Allison used his jab but Juan stayed in front of him with head movement. Heraldez used combinations to answer back, the counter game was now in effect. Heraldez putting in the work in the 3rd landing his over hand 2, with 1 minute and 5 seconds into the round Allison found himself in trouble forcing the bout to be called by TKO. 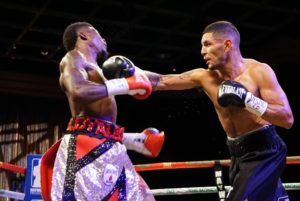 Heraldez stated ¨I feel that I did good, I showed that I’m in another league and these guys don’t belong in with me!¨ The hard hitting undefeated fighter is on the rise and looking for his next Victory. 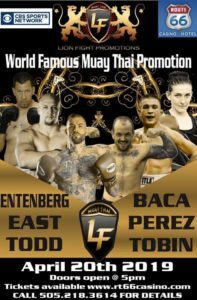 Another great action packed event presented by the Money Team leading the way in the sport. They are the past, the present, and the future.